I printed out all of the parts for this upgrade and then dismantled my FolgerTech i3 2020 and upgraded it and nothing worked properly after that. 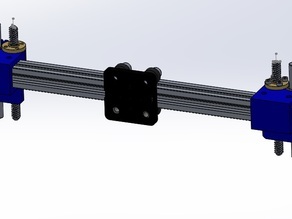 Eventually I learned that when you upgrade to the 8mm screws you need to redo the math for the Z axis. With a lot of time and effort I was able to get the printer working again and now it is quieter and more reliable. For the X-axis I didn't cut down the 500mm 2020 because I wanted to be able t use it in the next rebuild of this printer into a HyperCube. I printed all of the parts in PETG which makes for really strong parts. Thanks for the great design work you did on the upgrade. Most of my problems were just ignorance on my part. Sorry to hear your road to completely this was rocky, but so glad you got it done and are enjoying the upgrade.